It's a great pleasure having you here. We have decided to emphasize fish and seafood with a commitment to absolute freshness and exceptional quality. In addition to our superior fish and seafood, our Greek cuisine consists of all elements forming the basis of the Mediterranean diet. Our goal is for every patron to always enjoy our Greek cuisine. If you do, please tell your friends. If anything at Onasis should ever displease you, please tell us. Thanks, Epharisto! Click to view Today's Specials! 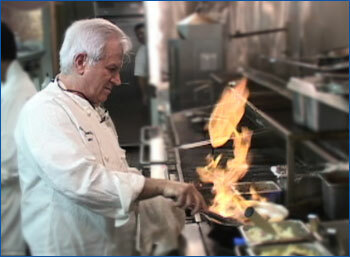 Owner and chef Tom Konidaris. IMPORTANT! Correction to NJ Monthly review! Read	the	latest	review	from	the	Philadelphia	Inquirer. Please read our March '07 review in the Philadelphia Inquirer. See our Table Talk review, Philadelphia Inquirer. Check out our review in the Courier Post.